Are you a big fan of classic games? Do you love going to the fairground, carnival, or arcade? Then our amazing High Striker game is the right fit for you. This is the perfect game to gauge your power and strength. For decades, this game has been the center of attention in classic and modern festivities. It is also a great addition to contemporary settings, such as amusement parks, school events, birthday parties, and other kinds of celebrations. The game is known all over the world. It comes in other names, depending on where it is played, such as the Strongman Game or the Strength Tester. 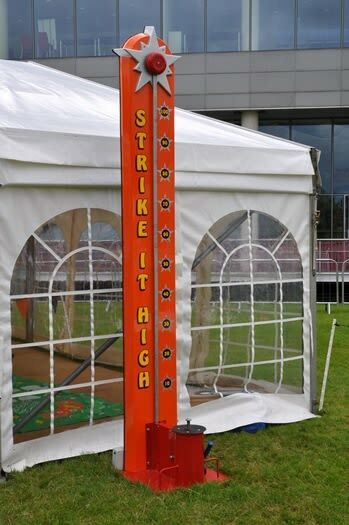 High Striker is both a game and an attraction, commonly seen in carnivals, fun fairs, and even fundraisers. This game could not be any simpler - simply pick up the mallet, take a deep breath, and hit the platform as hard as you can. As you hit it, the marker will keep rising, depending on how strong your hit was. If you’re really strong, then you will be able to achieve the ultimate goal: to strike the bell at the very top. Very few have succeeded in doing so - only the toughest, bravest, and strongest ones have struck the bell. There is added fun when the facilitator or host of the game attempts to entice passers-by to try the High Striker using phrases such as “Test your power and might!” “Step right up!” and “Hey there lads, which one of you are real men?” Keeping in mind that this game came to be decades ago, it was probably designed to showcase the brute strength of men, partly to compete against other men, and partly to impress women. Today, this game is best suited for kids and adults alike, men and women. You can even hold mini tournaments in your party and have your guests compete with each other. You will surely have a great time with this game. Whatever the reason for celebration, you are assured that everyone there will have a great time - and your party will be the talk of the town. You can have your own High Striker for any event. As long as you have sufficient space, you can place it anywhere - indoors or outdoors. The game needs an area that is 4 feet long, 3 feet wide, and 12 feet tall. It can work on all surfaces: concrete, wood, and even grass. This means you can have it inside your home, in a hall, in your garden, in a field or even by the pool. You don’t need to worry about anything, because we’ll take care of all setting up and installation tasks. The mallet is already included, and no electricity is required to operate the game. So what are you waiting for? Contact us for more information, check out our FAQs page for quick answers to your questions, and BOOK YOUR OWN HIGH STRIKER NOW! All you need for a fun party is right here at MJ Castles!